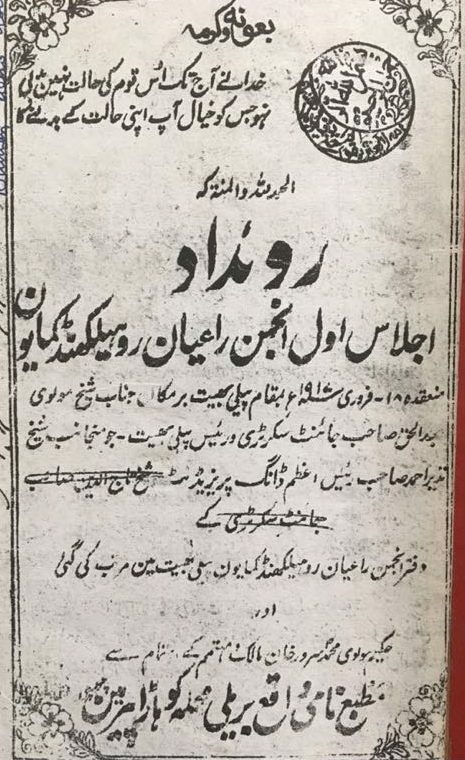 On 18th February 1917, a zamindar from a nearby village Daang, Pargana Jahanabad addressed a convocational gathering at Karghaina Building, Pilibhit, United Provinces as President of the Anjuman. I translated excerpts of his speech published in the Rawaid (minutes/proceedings of the convocation) from Bareilly in the same year. It reflected the profound insight of the man towards the role & the importance of modern education. “Modern education is the only tool to remove ignorance among communities. Muslims like other communities in subcontinent don’t have an inclination for modern education and this is the reason of the lagging of Muslims in all walks of life. Especially for our community in Rohilkhand, we are deliberately parting away from modern education. It is the lack of the modern education which is responsible for our heavy losses to the zamindari estates, and it will remain same in future. It would be a sense of grief for all of us that in the time of British governance that blessed us with a lot of favors, facilities, and freedom and still if our community would be isolated from the jewel of modern education. It should be our duty and efforts that we should accept the importance of modern education from our hearts. By the grace of God, you all are quite capable of resources to provide higher education to our young generation and also to those orphans of the community those are in utmost need. Therefore it is necessary to donate hefty amounts related to the scholarships for higher education.”– Speech Sheikh Ahmad Nazeer, 1917AD . 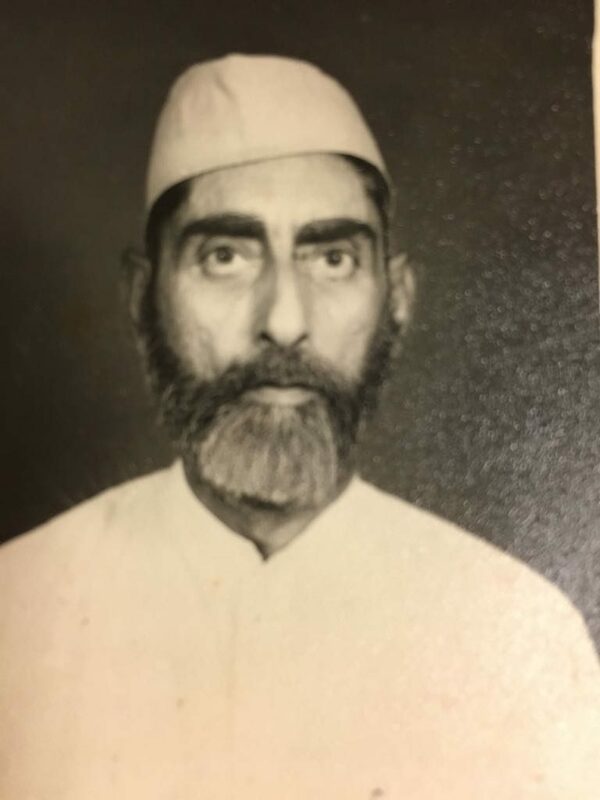 Family Background and Introduction: Sheikh Taj Mohammad was the founder of the household in Rohillkhand region and sixth in the generation of Sheikh Taj Mohammad was born Sheikh Nazeer Ahmad in the family Sheikh Mohammad Buksh . According to Tarrekh Arain his ancestors originally belonged to Salarpur, District Jalandhar, Punjab, who migrated to Mangala, District Sirsa (presently in Haryana) and then moved to Rohilkhand in the late 18th century . Nevill in the District Gazette of Pilibhit (1909) cited the family of Sheikh Nazeer Ahmad as one of the notable and leading zamindars of Pargana Jahanabad, District Pilibhit . 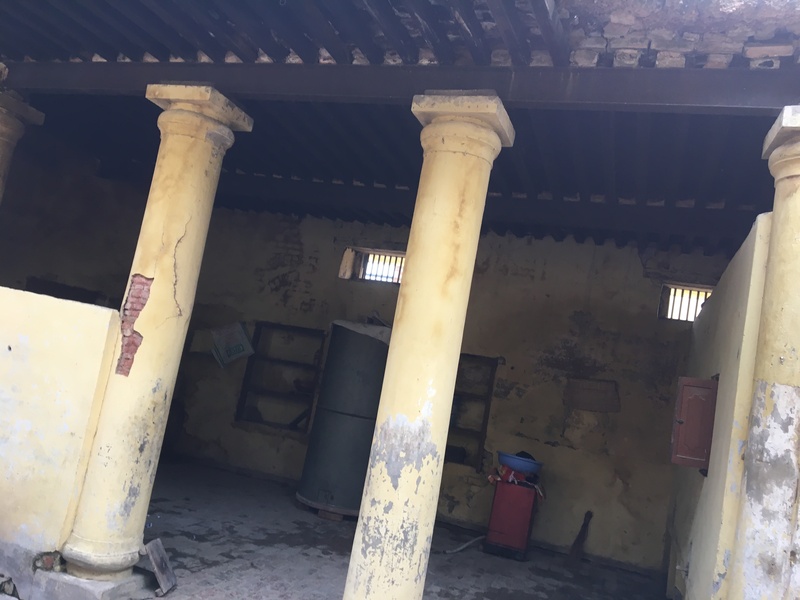 His father Haji Sheikh Mohammad Buksh was a pious landlord who donated a considerable property from his zamindari shares in Pargana Richaa, District Bareilly to the waqf of the historic Jama Masjid, Pilibhit. 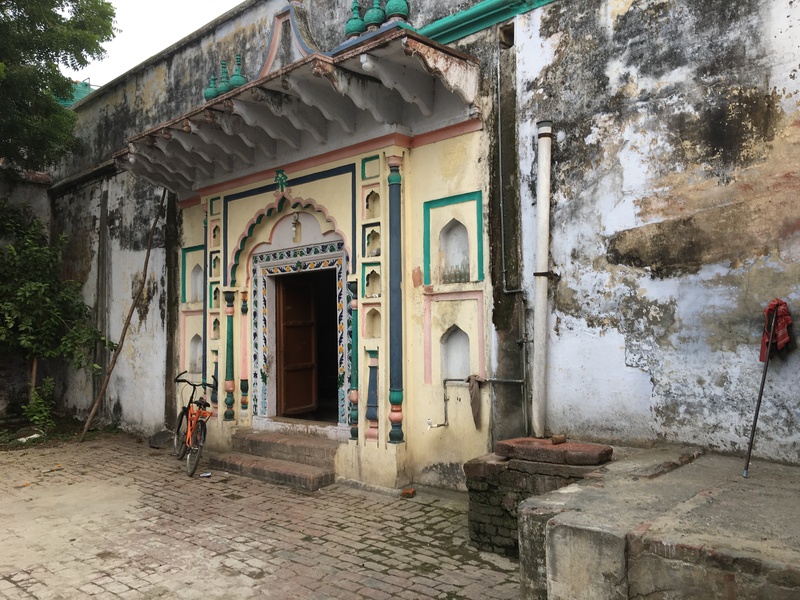 In the late 19th century, a Madarsa was also stared by his father at Village Daang, the headquarter of his zamindari estate. As the trend of the time among prosperous cultured families in those days, he was groomed by his father & private tutors. He had a good understanding of Arabic, Persian, and Urdu. 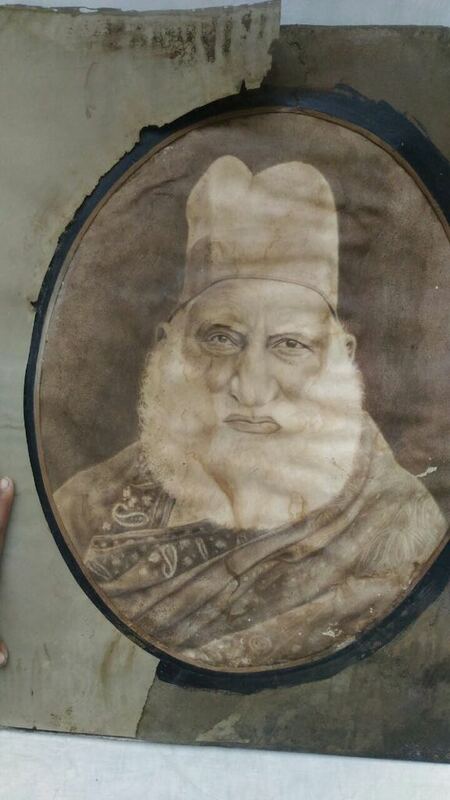 Description of his estate: The District Gazette of Pilibhit cited the revenue of his estate “Sheikh Nazeer Ahmad son of Sheikh Mohammad Buksh, an Arain hold seven villages and fifteen shares in District Pilibhit and pay revenue of ten thousand four hundred thirty-eight INR (Drake, 1934AD) ”. He also held three whole villages in District Bareilly. Eighteen years later when the assessment report was prepared for the abolition of zamindari system based on the revenue in United Provinces, the total number of the zamindars in the highest strata i.e., ten thousand Indian Rupees were only three hundred ninety . On reviewing District Gazetteer, I found that it was the highest revenue paid to the Government in Pargana Jahanabad and third highest in the District. As a foresighted man, he understood the outcomes of the upcoming reforms of United Provinces. It was during his time, the Daang estate also created a huge agrarian farm under the category of “Sir/Khudkasht” land with newly introduced machines and tractor. All these records showed that he belonged to one of the richest families in the district and among the top strata of United Province’s zamindar aristocracy. In 1952 after the abolition of Zamindari his descendants were able to hold an agrarian farmland spread over an area of more than two hundred acres of the land. He also had an honorary exemption from British Government arm acts . Services & Charities: Whether it was the organization of feast on special occasions of Muharram, Rabi Ul Awwal or the expense of the “Urs” of the revered saint who was resting in the premises of Jahanabad Police Station, Sheikh Nazeer Ahmad continued the traditional charities of his forefathers. Aged locals still recalled him and his father as “Chote Miyan” and “Bade Miyan” who always treated their ancestors with generosity irrespective of their caste, creed, religion & social status. A trait that was rare to be found among the zamindars in the stratified rural settings of Colonial India. In 1915, he was one from Rohilkhand Arain community along with Shiekh Tajuddin, his brother Shiekh Wisluddin and Sheikh Abdul Haqq who attended the Arain convocation held at Lahore under the leadership of Sir Mian Mohammad Shafi. The main goal was to spread the awareness of the modern education. On 16 March 1916, Anjuman Arain, Rohilkhand & Kumaon was formed with its main goal to push the community towards modern education. Shiekh Nazeer Ahmad was appointed as the President of this society. During the span of a year handsome amount of three thousand three hundred twenty was collected with a donation of more than two hundred Indian Rupees by him. Almost a century before, two hundred Indian Rupees was the monthly salary of Class one officer. Among the many beneficiaries of this Anjuman, the foremost was Dr. Abdul Ghafor who got Indian Rupees Four/Month scholarship for his studies at Agra Medical School. He was also one of the contributors in established of first Islamia School at the district in 1932. The madrasa established by his father at the headquarter of the estate, Village Daang was also upgraded by him. It continued to serve as the junior high school till 1980s long after his death.His hospitality was still recalled by the locals. His ninety-year-old daughter informed that kitchen of his father offered food on daily basis to rich, poor, needy and passing by strangers. The ladies of the family personally supervised the daily preparations on the larger scale with the assistance of maids and trail of helpers. The capacious kitchen that was once famous for its hospitality was located in Zenan Khana of the haveli. With the size of approximately 800 square yards, its arrangement is like a small apartment. The roof of covered area is supported by iron grids and timber. 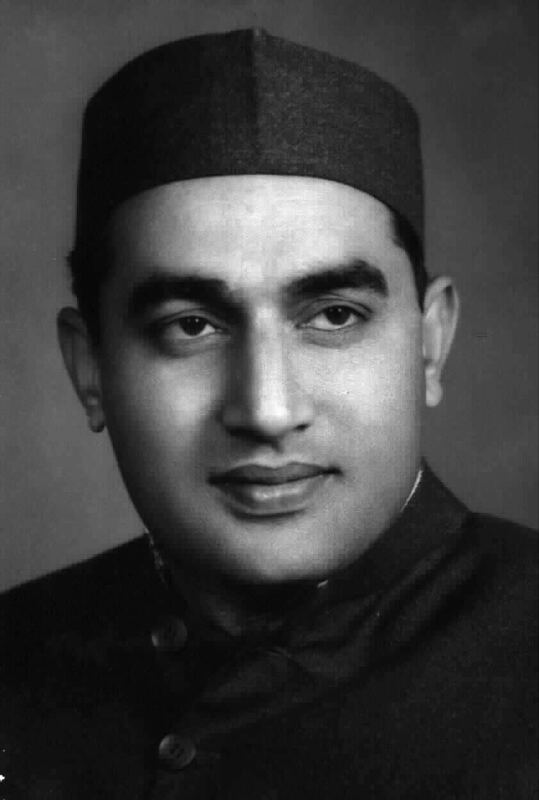 Legacy: During his life, he was highly influenced by the educational moves and reforms of Sir Mian Mohammad Shafi (a Punjabi leader of Muslim league, educationist, Politician and Vice President of Viceroy Executive council) but maintained his stance to remained away from the political ideology of Muslim league. From his children, no one moved to Pakistan at the time of the partition. Later one daughter and youngest son relocated to Pakistan in last decade of the fifties due to matrimonial ties. He left behind a handwritten diary that he used to document relevant pieces of his life. Few pages had been shared by his grandson, Mr. Mohammad Aslam that showed the date, year, time of the birth of all his children. 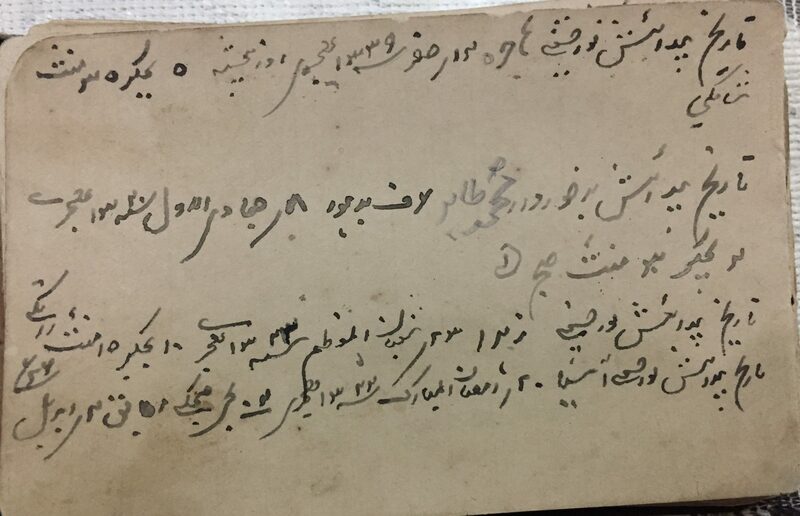 A handwritten page from the diary of the Shiekh Nazeer Ahmad shared by his grandson, Mr. Mohammad Aslam. Mr. Mohammad Ahmad, the eldest son of Sheikh Nazeer Ahmad. He was born on 16 October 1914. After his death, he managed the estate and then continued to maintain seat the of ancestors after the abolition of zamindari. In the sixties for the education of the kids, he moved to Pilibhit City and build a home at Karghaina Building. He also stared retail business of textiles as the business venture in changing time. After the death of his wife in 1976, he took the retirement and finally moved to Aligarh where his daughter was living in 1980. He was survived by four sons and three daughters. His last resting place is located at Aligarh. The photograph of the second son of the Sheikh Nazeer Ahmad, Mr. Mohammad Tahir. He was born at 08 Jamadul Awwal, 1340 of Hijri Calendar as given in the diary of his father., Sheikh Nazeer Ahmad. The converter gives the date in Gregorian, January 1922. 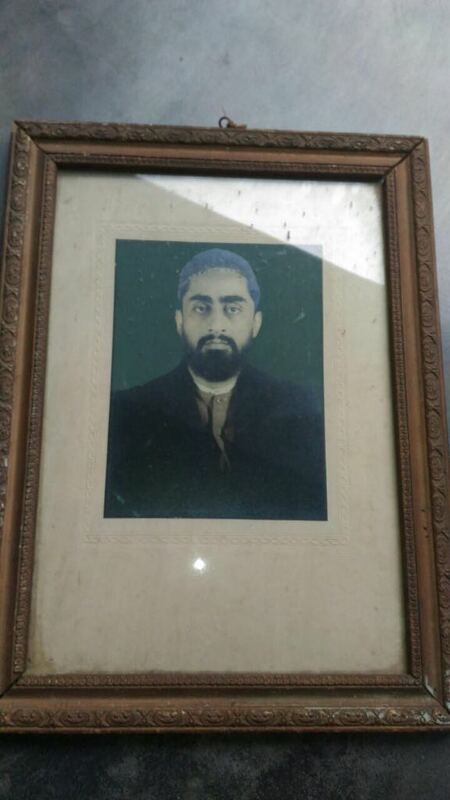 Mr. Mohammad Tahir passed in 1964 leaving behind two sons. The eldest one residing at Pilibhit and the younger one is software professional in Dubai, UAE. Sheikh Nazeer Ahmad took his last breath in 1947 at the age of seventy and buried at family graveyard at Village Daang, the seat of his ancestors. He was survived by three sons, eldest Mr. Mohammad Ahmad, second, Mr. Mohammad Tahir and youngest Mr. Mohammad Athar and six daughters. 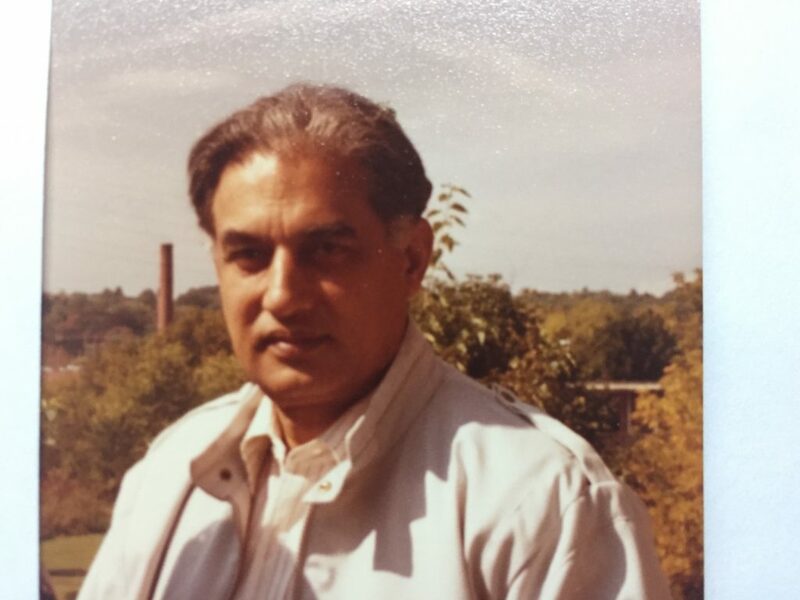 Mr. Mohammad Athar moved to Italy after completing his Masters in Geology from Aligarh Muslim University in 1958. He got married to Miss. Anjum Ara Naeemi, the daughter of Mr. Abdul Hafeez Naeemi in 1960. Her wife was also 1957 graduate of Aligarh Muslim University. After his return from Italy, he joined as a geologist at ONGC India, Limited at Dehradun. In 1967, the couple relocated to Pakistan where he joined as Assistant Director in Ministry of Petroleum and Natural resources. Working at different positions, he retired as the Additional Secretary of Ministry of Finance, Pakistan in the year 1999. Among the daughters, only Mrs. Hajra Begum moved to Pakistan. She was born on 28th October 1920 and married to the Mr. Abdul Khaliq Jilani, S/O Hafiz Abdul Rasheed of Village Karghaina, Pilibhit. Mr. Abdul Khaliq Jilani relocated to Pakistan and retired as Deputy Controller, Military Accounts. Portrait of Mr. Mohammad Athar, the youngest son of Sheikh Nazeer Ahmad. 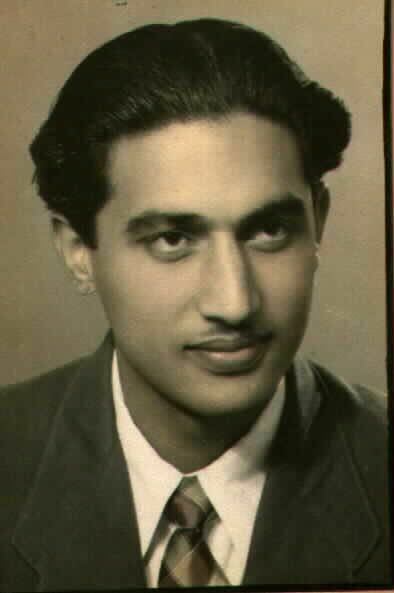 This photograph date back to his Aligarh Muslim University days as a student at Department of Geology. He completed his masters from AMU, Aligarh in 1958. Portrait of Mr. Mohammad Athar probably from India. Joined ONGC after returning from Italy and relocated to Pakistan in 1967. In Pakistan, he started his carrerr in Ministry of Petroleum and Natural resources and retired as additional secretary of finance, Pakistan in the year 1999. Mr. Mohammad Athar, born June 12, 1933, at Village Daang and passed on June 18, 2004, at Islamabad, Pakistan. His last resting place is in Islamabad, Pakistan. He is survived by one daughter and two sons. The eldest one daughter is Doctor at Pakistan Institute of Medical Sciences, Islamabad and both of the Sons are settled in Houston, Texas, United States. 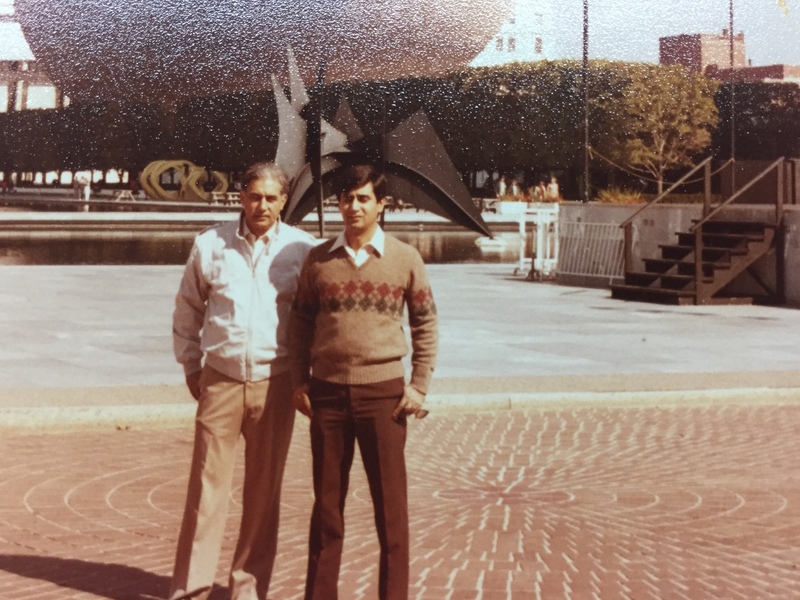 Portrait of Mr. Mohammad Athar with his nephew Mr. Mohammad Aslam from Albany, Newyork during one his visits to the United States in 1984. The eldest son, Mr. Mohammad Ahmad continued maintained his estate for short span before its abolition. Shortly after the death of his father, the zamindari abolition act was passed and villages came under the direct control of the government. The family retained the possession of agrarian lands, haveli, and other assets till the seventies. Seventy years had passed and now all his children also passed away except his one daughter, Mrs. Asiya. Born on 04th April 1926, she is currently residing with his son at Aligarh. 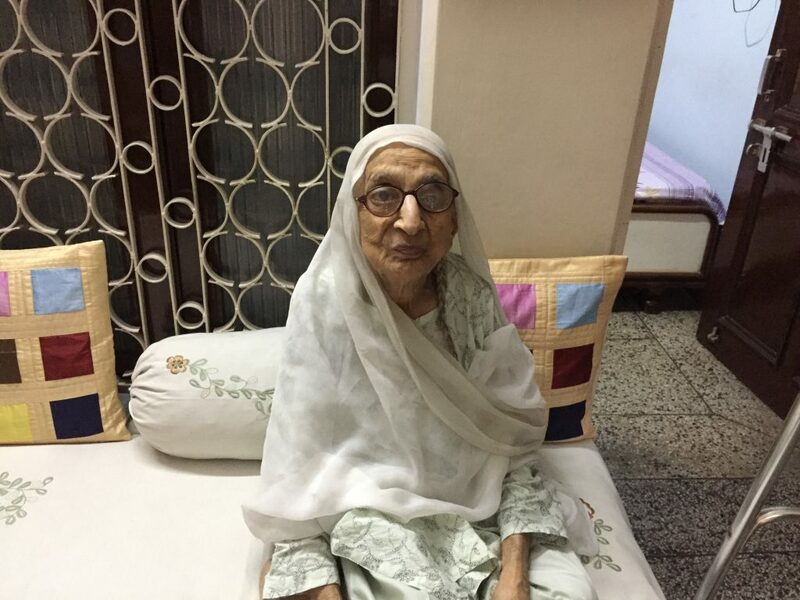 Mrs. Asiya Begum, the only surviving offspring of Sheikh Nazeer Ahmad. She was born on 20 Ramzan, 1344 Hijri (04th April 1926). Married to the Son of Khan Bahadur Shiekh Imtiaz Ahmad of Khamaria. She currently resides with his only son at Aligarh. His son a Professor of Botany recently retired from services as Head of the Botany Department, AMU, Aligarh. She still recollected her memories of childhood days that witnessed the heydays of Daang estate under his father, Sheikh Nazeer Ahmad. 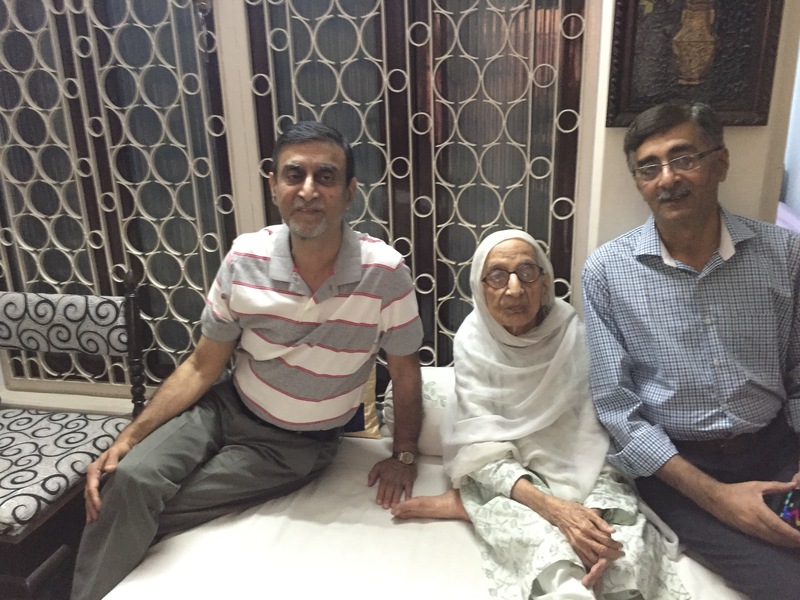 Mrs. Asiya Begum with two of his nephews. On her right flank, Mr. Mohammad Aslam (Son of Mr. Mohammad Ahmad), and left flank, Mr. Mujeeb Ur Rehman (Son of Mr. Mohammad Tahir). Photograph by the courtesy of Mr. Mohammad Aslam who recently visited homeland from Houston. The third and fourth generation descendants have relocated to Pilibhit city, Aligarh, Karachi, Houston (few other cities of United States), and Dubai. None of them were left in the seat of their illustrious ancestors. 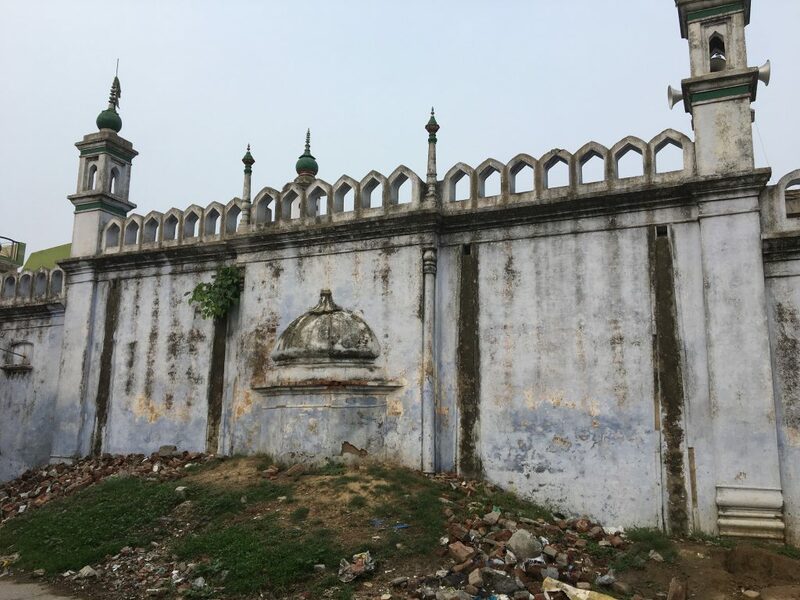 During my exploration of Village Daang, I was spellbound that Sheikh Nazeer Ahmad & his pious father Haji Sheikh Muhammad Buksh are still alive in the heart of local villagers as “Chote Miyan” and “Bade Miyan”. One of the entrances to the inner courtyard of female section. There is a brick courtyard with bounded by the high wall before this gate. Acknowledgments: Thanks to Mr. Mohammad Aslam for sharing the rare family portraits and diary pages. He is the grandson of Sheikh Nazeer Ahmad living in the Houston, Texas, United States from last thirty years. A doctorate in organic chemistry, he is an alumnus of Aligarh Muslim University, India & University of West Ontario, Canada. He passed his Masters in Organic Chemistry from Aligarh Muslim University in 1975 and completed his Ph.D. from University of Western Ontario, London, Canada in 1981. Formerly, he had been Vice President, Research, and Development at Lonza Group, a global organization for providing solutions for pharma and healthcare. Note: In changing 21st-century, the members of small Punjabi Diasporic community (Arain/Rain) having roots from the villages of Rohilkhand & Kumaon (Bareilly, Pilibhit & District Nainital) can be found in Pakistan, Middle Eastern countries, Canda, United States, & other western countries. Its the efforts of their elders who made great efforts more than a century ago to push the community towards modern education. Anjuman: An Urdu term used for the societies/organizations. Raees: The literal meaning is “Rich”. It was common practice to be used as an honorary appellation with the landlords of Urdu speaking United Provinces in Colonial India. Rawaid: The literal meaning of “Rawaid” is to perform or officiate. Here it is used in a context to document or officiate the proceedings of the Anjuman meet. Sir/Khudkasht: A category of the land that is cultivated by the zamindars by their own efforts. When zamindari reforms were passed, they were allowed to hold “Khudkasht/ self-cultivated” lands. Zamindar: A medieval Urdu term used for the landlord in Colonial India. Ahmad, N. (1917), Rawaid Ajlas Awwal, Anjuman Arain, Rohilkhand and Kumaon, conducted on 18th February 1917 AD at the house of Sheikh Maulvi Abdul Haqq, Joint secretary, and Raees Pilibhit. From Sheikh Nazeer Ahmad Raees e Azam Daang and President, and Shiekh Tajuddin Sahib, Raees Hulkari Dhakia, Secretary. Printed and designed at Kohadapeer, Bareilly. Ishaaq, M., and Naseem, M. (2001), In Chapter thirteen, Arain, Sangam offset and press, pp.36. Chaudhry, Asgahr A. (1963), chapter three, Tarrekh Arain, 5th Ed., Asghar Ali Chaudhry, Ilmi Kutubkhana, Urdu Bazar, Lahore, pp.148. Nevill, H.R. (1909), PILIBHIT: A Gazetteer of the District Gazetteers of United Provinces of Agra and Oudh, VolXVIII. Rudade Ajlas Awwal, Anjumane Arain, Rohilkhand and Kumaon, conducted on 18th February 1917 AD at the house of Sheikh Maulvi Abdul Haqq, Joint secretary, and Raees Pilibhit. From Sheikh Nazeer Ahmad Raeese Azam Daang and President, and Shiekh Tajuddin Sahib, Raees Hulkari Dhakia, Joint Secretary. Printed and designed at Kohadapeer, Bareilly. Chaudhry, Asgahr A. (1963), chapter three, Tarrekh Arain, 5th Ed., Asghar Ali Chaudhry, Ilmi Kutubkhana, Urdu Bazaar, Lahore, pp.141. Drake-Brockman, D.L. (1934), District Gazeeter of United Provinces of Agra and Oudh, Supplement D: Pilibhit District. Jazakallah khair Tauseef Sahab for your lovely and motivating feedback.